What does the next trend in t-shirts that gladly contribute to the communication of stereotypes look like? TCM makes a prediction. In line with previous shirts that seek to categorize types, which is indeed the point of stereotypes after all, two recent categorizations are likely to make it on to t-shirts in the not too distant future. Too bad they don’t seem to have made it to the Christmas purchasing rush. They need only find a way to fit all of this valuable information on a t-shirt to make historic sales. This t-shirt is absolutely hilarious but also a great example of the stereotype of New Jersey. New Jersey has such a bad reputation around the United States and this t-shirt shows it. I live near Seaside, New Jersey which happens to be the place where the MTV reality show “The Jersey Shore” is taped. However, where I live happens to be a very nice neighborhood that does not include any “fist-pumping guidos” that the show seems to interpret are on every corner where I live. I went to Catholic School and all of my best friends live in the town of Spring Lake which is in the “Working Class with Beach Houses” section. However, Spring Lake is one of the wealthiest towns in all of New Jersey. Just because it is close to Seaside Heights it automatically gets the bad stereotype of the “fist-pumping guidos”. New Jersey is stereotyped so greatly by being a bunch of maffiosos ever since the movies of Italian mobsters that have come out in the recent years. 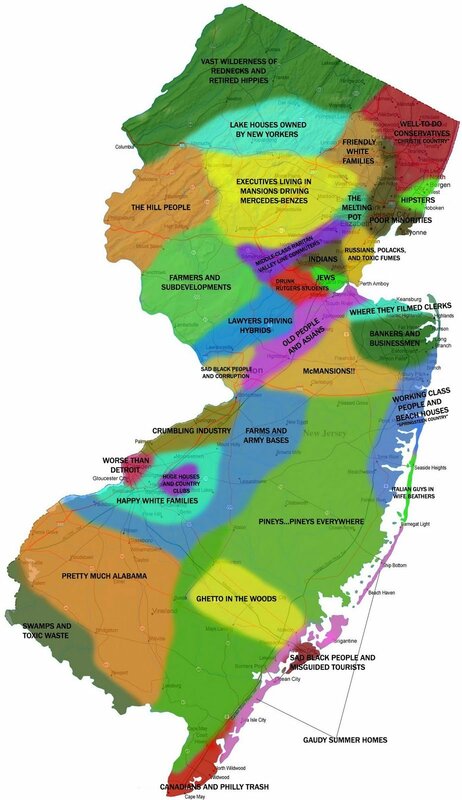 Even the television shows about New Jersey such as “The Real Housewives of New Jersey” or as I previously stated “The Jersey Shore” are examples of negative stereotypes of people in New Jersey. However, stereotypes are not always true and can not really describe the people whom they are supposed to. Especially this t-shirt can not describe people purely where they live in relation to New Jersey.